From the 1950s to the end of the twentieth century, Boston transformed from a city in freefall into a thriving metropolis, as modern glass skyscrapers sprouted up in the midst of iconic brick rowhouses. After decades of corruption and graft, a new generation of politicians swept into office, seeking to revitalize Boston through large-scale urban renewal projects. The most important of these was a new city hall, which they hoped would project a bold vision of civic participation. The massive Brutalist building that was unveiled in 1962 stands apart -- emblematic of the city’s rebirth through avant-garde design. And yet Boston City Hall frequently ranks among the country’s ugliest buildings. Concrete Changes seeks to answer a common question for contemporary viewers: How did this happen? 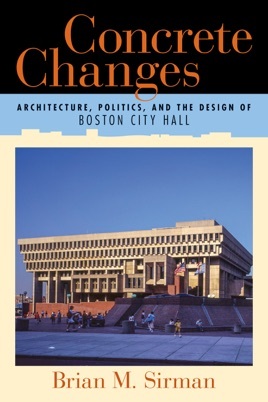 In a lively narrative filled with big personalities and newspaper accounts, Brian M. Sirman argues that this structure is more than a symbol of Boston’s modernization; it acted as a catalyst for political, social, and economic change.